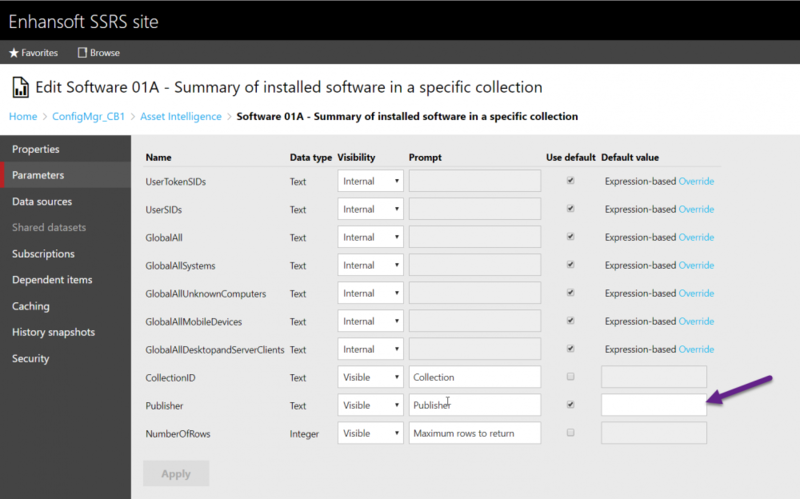 I have a need to copy the report "Software 01A - Summary of installed software in a specific collection" and want to set default parameters for the 3 drop downs. I can successfully set the "Collection" and "Maximum Rows to Return" parameters, but have not been able to figure out a way to set the default "Publisher" parameter to (ALL). if you look at the RDL you will see that it is a Null to get the (All) for the prompt. After changing the parameter to "Allow null value" and going into default values and adding a new specified value that defaults to (Null). This results in the report still asking for you to select a value. So to be clear, you give it a Null value like this? After seeing yours, I removed the (Null) from the value and leaving it blank got what I needed.